Varèse Sarabande will release The Woman Astronaut - Original Concept Album digitally and on CD July 10, 2015. The album features the original music composed by Penka Kouneva (the game PRINCE OF PERSIA: FORGOTTEN SANDS). The Woman Astronaut is an original concept album composed in cinematic orchestral-electronic style. The album has 14 tracks, broken into three acts about the life journey of an astronaut: adolescence and homeland; young adult; maturity. The Woman Astronaut was produced with Hollywood Studio Orchestra, top LA soloists and choir. A Kickstarter campaign raised $35,000 and provided the funds for the orchestral recording. “The Woman Astronaut is a personal, autobiographical journey of an ambitious, self-determined woman who has chosen a very unusual profession,” Kouneva said. Game & film composer Penka Kouneva began her career in film/TV in 2000. Working alongside Steve Jablonsky she scored PRINCE OF PERSIA: FORGOTTEN SANDS and TRANSFORMERS: REVENGE OF THE FALLEN games. Her solo composing credits include the indie features THE THIRD NAIL, MIDNIGHT MOVIE, and telefilms ICE SPIDERS, CHUPACABRA, NUCLEAR HURRICANE. Recently, Kouneva scored the games H-Hour: World's Elite, ROLLERS OF THE REALM (PS4), IronKill, Hades and others. Kouneva was also an orchestrator on the Matrix, Transformers, Pirates franchises, as a lead orchestrator/soundtrack producer on Elysium, Ender's Game, Need For Speed (films); and on World of Warcraft, Starcraft II, Gears of War 2, 3, Sims 3, Diablo III, Dragon Age II, Bloodborne (games). Koneva's composition awards include: the SUNDANCE Composer Fellowship, two Ovation Awards, The Copland Award, Hollywood Music in Media Award, Square Enix Music Online, Independent Music Award. She is on the Advisory Board of Game Developers Conference, an Advisor for the Sundance Institute, and is a member of the Alliance for Women Film Composers. Varèse Sarabande will release The Woman Astronaut - Original Concept Album digitally and on CD July 10, 2015. Richness and fullness to be that score to a film that isn't a film. As we are whisked from track to next, we are swept to the darkness of space only to find yourself moving along the side of an invisible ship in it's travels. I have had the great pleasure of working with Penka on a few projects and every new release from her always amazes me to think "things do get better", not that was any problem with prior releases... she just shines here. 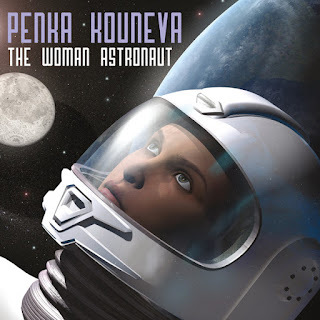 Penka finds huge support from her family, friends and composer pals she has encounter over the years... with love and tons of respect I give you all "THE WOMAN ASTRONAUT" by composer Penka Kouneva.